Our New ApexIDX MLS Search System features an amazing live Google map search, with all the trimmings! As Google Advertising and Marketing Partners, how could we not use the world’s best map search on our systems? Our live map will display home Icons on the Google map (in either Map display or Satellite display). Click on a home icon and it will pop-up a small thumbnail image of the home with basic information on it. You can then click on to view a highly detailed page with lots of information and photos for that property. 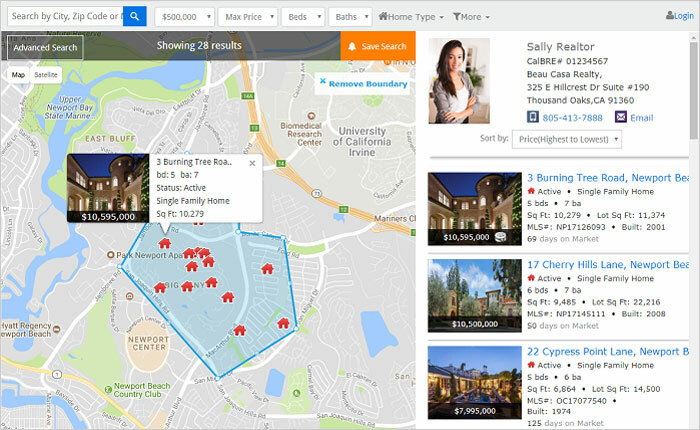 To the right of the map is a list of property thumbnails with more information on each property. If you mouse over the list, the corresponding home Icon on the map will be highlighted by popping up a thumb at that home your mouse is over. This allows users to see where the homes are on the map while quickly skimming over several homes in a row. 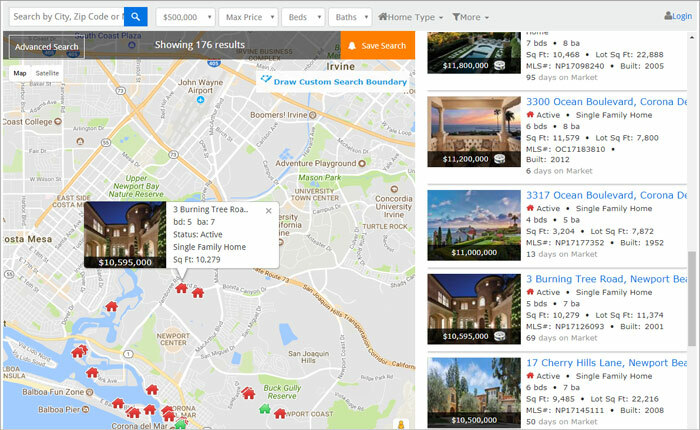 One your visitor has clicked on a listing a new real estate detailed listing page will appear with all the information on the property a user could want (and all the lead capture opportunities you could want!). Each Detailed Listing Page has its own smaller map on it further down the page! This reinforces the User on the exact map location for that property. These days Users expect to see a map in their search for properties so they can orient themselves at all times. Any IDX without a great live map search is doing a disservice to its users. At RealtyTech we lead with a map to keep your visitors happy and to keep you in a positive light for them.